PADnD Homepage	Board index General Chat The Tavern Think of the poor PCs! I don't usually get political, but this was too good not to post. Re: Think of the poor PCs! That was funny as heck! I don't know...I've killed plenty of PCs with d6s and d8s as well. 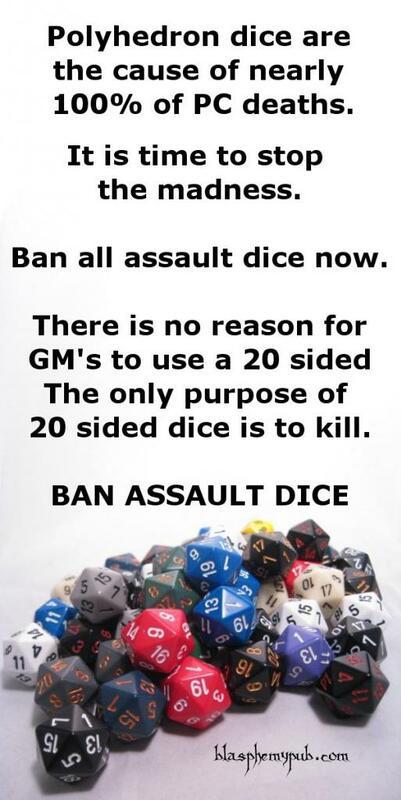 Maybe we should ban ALL DICE! I'm trying to arrange an interview on FOX news to talk about school shootings when these little snot nosed punks are on talking about banning guns, because I want to hit them with the fact that over 4,000 teens die every year from texting while driving, and so I want to ban their cell phones! I'm sure they'll appreciate my concern for their safety. Halaster-Blackcloak wrote: I'm trying to arrange an interview on FOX news to talk about school shootings when these little snot nosed punks are on talking about banning guns, because I want to hit them with the fact that over 4,000 teens die every year from texting while driving, and so I want to ban their cell phones! I'm sure they'll appreciate my concern for their safety. I've tried using that argument for the past 5 months on several boards, but most liberals just DON'T WANT TO HEAR IT.. I have a tendency, in real life, to back people into a corner on these things and not let them blow off the facts. I don't let them obfuscate, evade or avoid. I keep a sharp point on the points made. I'm also one of those people who, if I'm "debating" someone on the other side and they try their typical stupid stunt of talking over me, I simply raise my voice and talk over them. NEVER back down! Do you not have laws there in the US/Canada around texting/using mobile phones while driving? Wow, Hal, you're a real hero by standing up to the ultimate of bullies...school shooter survivors. I look forward to the statue they build in your honor. That aside, although this joke does have political undertones, it was not an invitation to start discussing politics, which is still against the rules. I'm going to lock this thread, as I can't see anything else coming out of it but more political talk. And to answer your question Lyrwik, it varies by state.